Candidates for Oregon’s state Senate showed the truth in that observation in their 2014 races, which led to campaign spending of $10 million. That’s right, $10 million to decide the winners of just 16 Senate seats in a state with a smaller population than Kentucky. That’s $10 million, enough to cover the annual tuition and fees of 1026 students at the University of Oregon. But wait. There’s more. Candidates in 3 of those 16 races ran unopposed and candidates in 7 others were in such uncompetitive races that the victor won by more than 15%. That leaves just 6 seats with real races. Of the 6 competitive races, the Democrats won 4 and the Republicans 2, giving the Democrats more solid control of the Senate. Based on filings with the Oregon Secretary of State, the committees of all the candidates for the 16 Senate seats spent a combined total of $7,816,657.33 in the primary and the general elections. 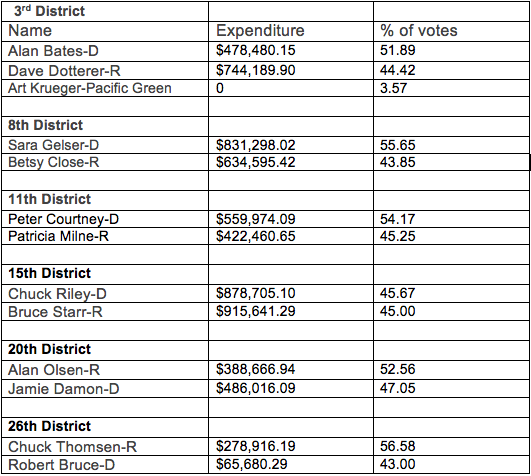 The most expensive race in terms of candidate committee spending expenditures was the one between Bruce Starr and Chuck Riley with total expenditures of $1,794,346.39. That made it the most expensive State Senate race in Oregon history. On top of these candidate committee expenditures, the Senate Republican and Democratic Party Leadership Funds spent a bundle. Figuring out how much they spent beyond the spending of the candidate committees gets a little tricky here. That’s because some of the money spent by the Senate Leadership Funds came from contributions by candidate committees. These contributions also show up as expenditures by the candidate committees, so counting them also as expenditures by the Leadership Funds would be double counting. Therefore, in order to accurately figure out additional spending by the Leadership Funds you have to subtract the money they received from the candidate committees. Got it? In the case of the Senate Democratic Leadership Fund, the contributions it received beyond donations from the candidate committees include $50,000 from Everytown for Gun Safety (former New York Mayor Michael Bloomberg’s operation), $100,000 from the Democratic Leadership Campaign Committee (A Washington, D.C.-based group that works to win state legislative seats and chambers for Democrats), and $50,000 from the Oregon Priorities PAC. After the election, Everytown for Gun Safety, which also contributed $75,000 to the successful State Senate campaign of Chuck Riley-D and $250,000 to Gov. Kitzhaber, boasted of its campaign influence. “…the election of Rep. Sara Gelser (who received $186,014.40 from the Senate Democratic Leadership Fund) to the state Senate signals a pro-background check majority in 2015, which clears the most significant roadblock in Everytown for Gun Safety’s work over the past two years to pass a background check bill there,” Everytown said. The extra expenditures by the Senate Democratic Leadership Fund, beyond contributions it received from candidate committees, totaled $1,140,387.53. In the case of The Leadership Fund for Senate Republicans, major contributions, beyond donations from the committees of the candidates running in 2014, included $15,000 from the Oregon Sportsmens Association PAC, $45,000 from the Oregon Family Farm Association PAC, $25,000 from the Taxpayers Association of Oregon PAC and $20,000 from the Pacific Seafood Group Employee PAC. The Republican Leadership Fund, just like the Democratic Leadership Fund, also received substantial sums from current state senators not running in 2014. Friends of Ted Ferrioli, for example, raised $305,298.28 in 2014, then turned around and donated $213,500 of that to the Republican Leadership Fund. Using the same formula as with the Senate Democratic Leadership Fund, the extra expenditures by The Leadership Fund for Senate Republicans totaled $1,222,851. Add it all up and you have $10,179,985.80. And that doesn’t even count money spent by other groups in support of Senate candidates, including some so-called dark money which will never be disclosed. Clearly, Oregon is headed for the big time. The question: what are the big contributors going to expect as a return on their investments? What do Tom Steyer of San Francisco (and Lake Tahoe and Pescadero) and Michael Bloomberg of New York (and Bermuda, London, Colorado and Florida) have to do with Oregon politics? A lot it turns out. 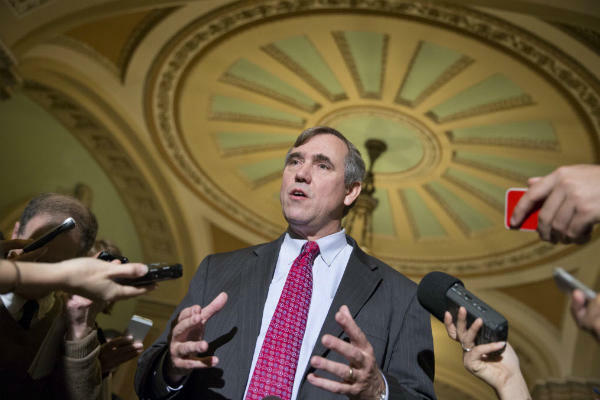 Their money helped the Democrats strengthen their hold on the Oregon Senate and potentially push through controversial environmental and gun control legislation. 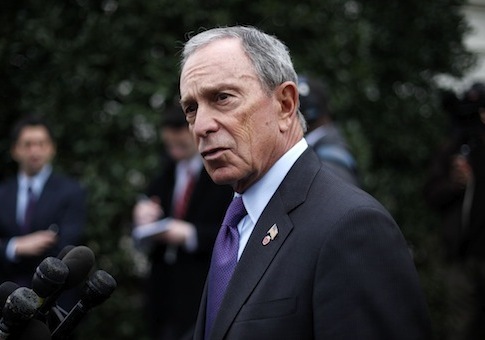 Bloomberg is the billionaire co-founder of Bloomberg L.P., a privately held financial software, data and media company based in New York City, and a former mayor of New York City. 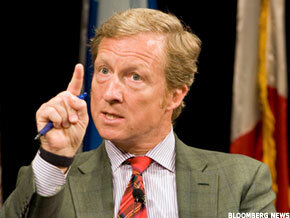 Steyer is a billionaire who co-founded the $21 billion Farallon Capital Management fund. He spent an estimated $65 million this election through his NextGen Climate political action committee (PAC) to help candidates who support the need to deal with climate change. Steyer spent $8.5 million in Colorado to help Democrat Sen. Mark Udall in his losing race against Republican Cory Gardner. He also spent $11 million in Iowa to help Democrat Bruce Braley in his losing Senate race against Republican Joni Ernst. His ambitions in Oregon were considerably more modest, but could still have a big impact. Here his NextGen PAC spent $130,000 to help Democrat Chuck Riley in his race against Republican State Senator Bruce Starr and Democrat Sara Gelser in her Senate race against Republican Betsy Close. Riley defeated Starr in a squeaker by just 221 votes, 17,930 to 17,709; Gelser handily defeated Close by 27,375 to 21,571. Riley’s campaign finance report doesn’t show any contributions from Streyer’s out-of-state PAC. That’s because the PAC donated the money to the Oregon League of Conservation Voters (OLCV) PAC, which is for all intents and purposes an arm of the Democratic Party. The in-state OLCV PAC then used the funds to support Riley, giving him a total of $191,120.02. To further bolster the Democrat’s cause, Steyer’s NextGen Climate Action Committee also gave $100,000 to the Democratic Party of Oregon. Gelser’s campaign finance report doesn’t show any contributions from Streyer’s out-of-state PAC either, but it does show $76,755.36 from the OLCV. Meanwhile, Bloomberg’s EveryTown for Gun Safety Action Fund sent $75,000 to Riley’s campaign, as well as $250,000 to Gov. Kitzhaber and $50,000 to the Senate Democratic Leadership Fund. 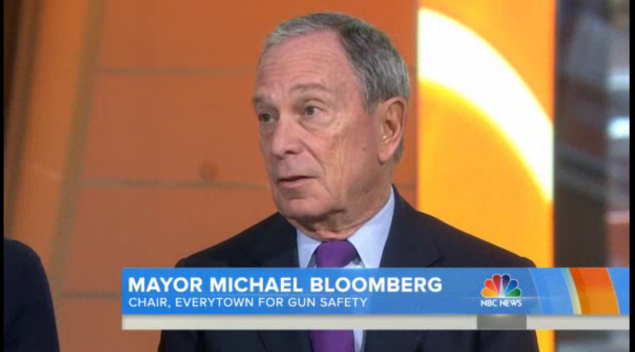 Everytown for Gun Safety was created earlier this year by combining a Bloomberg-backed group, Mayors Against Illegal Guns, with Moms Demand Action for Gun Sense in America, a movement that grew out of the Newtown shootings in 2012. The two groups have been working together since December. Did the Steyer and Bloomberg money make a difference? According to filings with the Oregon Secretary of State, Riley raised a total of $891,153.99 for his campaign and Starr a total of $901,097.63. That means a significant portion of Riley’s campaign money came just from Steyer and Bloomberg. Add whatever impact Steyer’s $100,000 donation to the Democratic Party of Oregon had on Riley’s race and these two out-of-staters likely played a huge role in Riley’s victory. According to filings with the Oregon Secretary of State, Gelser raised a total of $843,711.67 for her campaign. Of that, $76,755.36 came from the OLCV. Close raised significantly less, $556,628.14. The Steyer/OLCV money probably didn’t play as much of a key role in Gelser’s victory, but it surely helped expand her advantage. 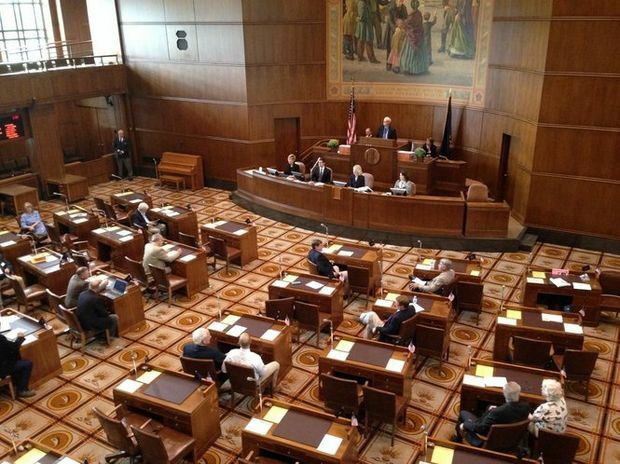 Oregon tried to limit the influence of out-of-state campaign contributions in 1994 when it passed Ballot Measure 6 that amended the Oregon Constitution to limit out-of-district contributions to 10 percent of the total. But a federal appeals court ruled in 1998 that the limit violated the First Amendment and was unconstitutional. So expect more of the same in future Oregon elections, and then some.